The total edition is 12 but each work will be different and therefore unique. 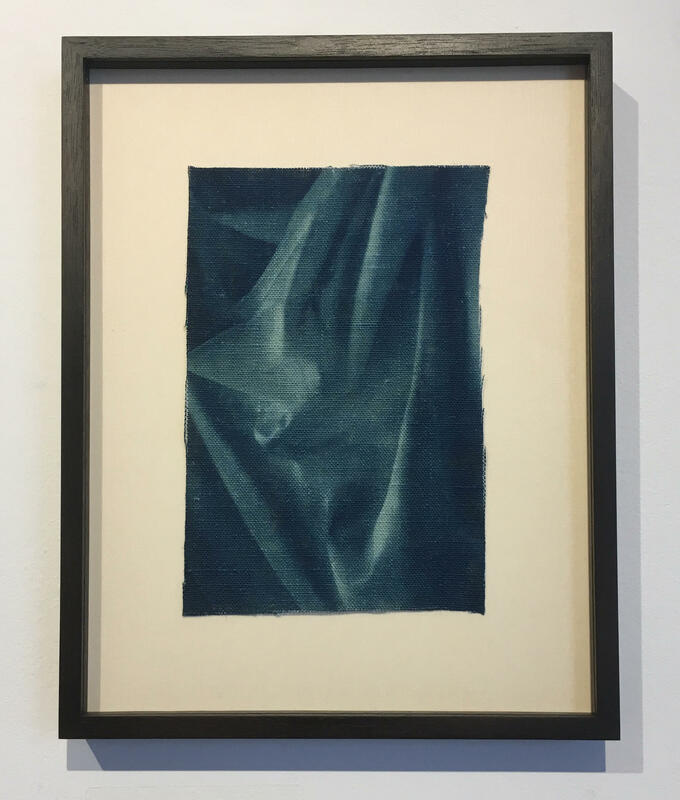 The nature of the cyanotype, printed on linen is that it is impossible to reproduce two identical images. There are many factores that play in, such as the intensity of the sunlight during exposure, the amount of cyanotype used for coating, and the amount of time and temperature of the water used for rinsing. This means that each version will be different. Please contact us if you want to know what the available print looks like exactly. a cyanotype of the sculpted folds of a garment. The close-up creates a trompel'oeil effect. Are you looking at folds in the canvas or are you looking at a depiction? Illusion and transient beauty are an essential part of The Pond. Over the past few years Danish artist Adam Jeppesen (1978, Kalundborg, Denmark) has sought stillness in deserted landscapes and in physical abandonment. His work has also been about the materiality and transience of the photo as an object. In his most recent work, he abandons the physical landscape, but he remains faithful to analogue photography. Adam Jeppesen studied at the Fatamorgana School of Art Photography in Denmark. He first gained international recognition with his Wake series, which was published by Steidl in 2008. His work has been displayed at various solo exhibitions in Denmark, Germany, Belgium and France, as well as multiple international group expositions. Jeppesen was nominated for the prestigious Deutsche Börse Prize in 2009 and 2016, as well as the KLM Paul Huf Award in 2009 and the Prix Pictet in 2016. His work has been incorporated into various museum collections, among them C/O Berlin, the National Museum of Photography in Denmark and the Denver Art Museum (US). In 2017 he had his first solo show at Foam and currently, his work is part of the Back to the Future exhibition that is on display at Foam until the 28th of March 2018. Jeppesen lives and works in Buenos Aires, Argentina. The vulnerability of the work requires a careful treatment. Therefore it is possible to order a framed version of this work through Foam Editions. Please contact Editions is you prefer to have a print without frame. The work will be carefully wrapped and send as an insured package. Shipment of the work will take 3-4 weeks. You will receive an e-mail with a Track & Trace code when the package is on its way. A framed copy is on display at Foam Editions, the gallery on the third floor of Foam Fotografiemuseum. For more information or questions about buying this print or the framed work, please contact the Foam Editions team.